This is my first real sword and I am truly impressed. 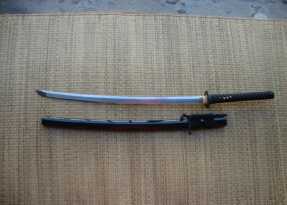 I ordered the katana on Friday morning and received it on the following Thursday. 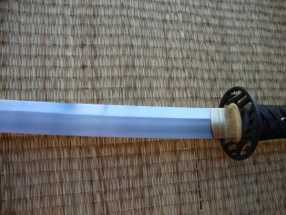 It has been used for about two weeks to cut milk jugs, water bottles, cardboard boxes and some old apples which I would not recommend due to the apple acid staining the blade if not wiped off immediately due to the acid in the fruit. The blade does seem to scuff easily but does not seem to dull, chip or bend after my limited usage. 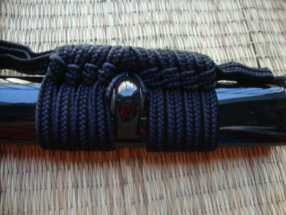 The saya has a nice tight fit and everything is wrapped tight and fit snugly. No loose rattle or shakes and no dents or dings to any part of the blade, tsuba or saya. The buffalo horn is actually a beautiful dark gray and black in the light and goes very nicely with the black theme of the 19. 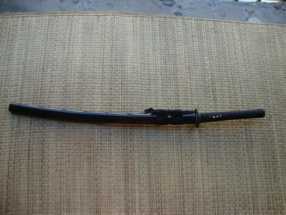 Ronin Katanas stick photo of this model do not do the sword justice as it looks much better in hand. 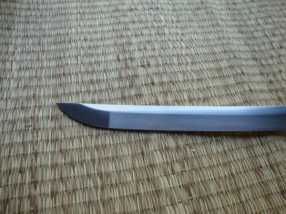 The blade appears to be made of quality and is paper cutting sharp and without blemishes. After careful examination I could see that the rayskin does not completely cover the handle. A gap can be observed under the synthetic silk wrap with very close examination under the parts not visible through the diamonds which is disappointing but unnoticeable without moving the silk with my thumb and keen inspection. Overall I am very pleased with this purchase and would buy again with the knowledge that this is a blade meant to be used and still look good as a wall hanger. SBG tracking was great and I feel the price paid is fair for the item received.